You are here: Home » SPORT » All ready: European Youth Olympic Festival to be opened Today! All ready: European Youth Olympic Festival to be opened Today! Minister of Foreign Affairs of Bosnia and Herzegovina Igor Crnadak will attend the ceremony of the opening of the European Youth Olympic Festival (EYOF 2019), which will be held at the Asim Ferhatović Hase Olympic Stadium in Sarajevo at 19:00 o’clock today. Thirty-five years ago, the capital city of Bosnia and Herzegovina hosted the best Olympics up to that time, and we are convinced that we will organize the best and most attended EYOF in history, said Mayor of Sarajevo Abdulah Skaka at the press conference held at Hotel Termag in Jahorina. The Conference was held as part of the EYOF 2019 participating countries head of missions’ seminar, the hosts of which are the cities of Sarajevo and East Sarajevo. The head of missions’ seminar is the biggest preparatory event for EYOF, which will take place in February next year. Apart from Mayor Skaka, the speakers at the conference included Siniša Kisić, President of BiH Olympic Committee, Senahid Godinjak manager of “EYOF 2019”, Mirela Mandal, representative of the BiH Ministry of Civil Affairs, and Dragan Jaćimović, RS Assistant Minister of Family, Youth and Sports. “We will show Sarajevo in the best possible light to the youth from across Europe. They will take with them the nicest memories and keep them for their entire lives, just as the world today still remembers the1984 WOG. The Olympic spirit and youth have once again shown that they can cross all barriers. This sport festival will have invaluable significance, not just for the development of sport, but also sport infrastructure, tourism, economy in Sarajevo and Bosnia and Herzegovina” said Mayor Skaka. 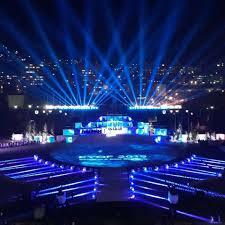 EYOF will be solemnly opened by the Chairman of Presidency of BiH Milorad Dodik. Held under the patronage of the IOC, and the pride of the European Olympic Committees with 25 years of tradition, the EYOF is the first top European multi-sport event aimed at young athletes aged 14 to 18. There is a winter and a summer edition, which take place in two-year cycles, in odd-numbered years. The EYOF belongs to the European Olympic Committees (EOC).